Flooded neighborhoods, roofs in the middle of the streets and scenes worthy of a post apocalyptic film are now what remains of the home of hundreds of thousands of Puerto Ricans facing one of the worst catastrophes in their history. According to official sources, at least six people died, three of who were from the municipality of Utuado and succumbed to landslides, according to the public security department. 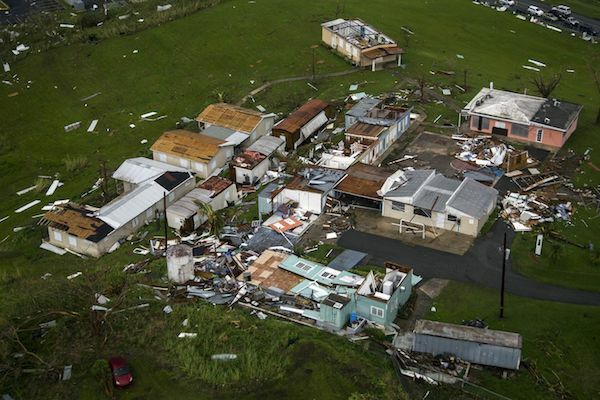 Two more people died in a flood in Toa Baja and another person died in Bayamón, when a board struck his head, according to The Washington Post. "We are aware of other reports of fatalities that have transpired by unofficial means but we cannot confirm them," said the secretary of the department of public safety, Héctor M. Pesquera. Due to the communicative blockage, the damages are still not evaluated in their totality, but aerial images and news sources help to determine an unimaginable degree of devastation. Photographs published by the media show neighborhoods in the southeastern part of the island totally covered by waters that reach even the second floor of the houses. A Washington Post-independent photographer, Dennis M. Rivera Pichardo, reported, "We saw houses with the roof ripped away totally, open like a can of tuna." The official report indicates that the damage caused by Hurricane Maria - the strongest storm in more than 80 years on the island - has spread throughout the Caribbean, including the Turks and Caicos Islands on Friday morning, heading towards the Bahamas where up to 50 centimeters of rain are expected. Currently, the rescue operations are trying to break through the rubble and water, to open the accesses between the municipalities that are isolated. For his part, Governor Ricardo Rosselló urged residents through local radio to stay in their homes. "It's still not safe in the roads. There's still a great deal of flooding," he said. "Now is not the time — unless it's an emergency — to be on the roads." If you are in Philadelphia and want to help the people affected in Puerto Rico, click here.